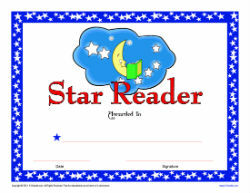 Below you’ll find free, printable reading award certificates in a variety of different styles and formats. Just click on the title to open the PDF and print. You’ll find reading awards for reading a specific number of books, ones for summer reading and more. Be sure to check out our printable bookmarks and reading logs too! Remember that ALL worksheets and printables on K12reader.com are free to print for classroom and home use. So print away and have fun! A fun, reading certificate in recognition of reading 10 books. A reading certificate in recognition of reading 15 books. A fun, reading certificate in recognition of reading 20 books. A reading certificate in recognition of reading 25 books. A reading certificate in recognition of reading 30 books. A reading certificate in recognition of reading 35 books. A reading certificate in recognition of reading 40 books. A fun, reading certificate in recognition of reading 45 books. A fun, reading certificate in recognition of reading 50 books.